At Wolfestone, we’ve developed a UK-exclusive telephone interpreting service that makes language interpreting quick, easy and affordable. Our state-of-the-art telephone interpreting service encompasses over 210 languages and is available on-demand. Simply download the app or access the service via desktop and you can be connected with a native, experienced linguist in under a minute – whenever and wherever you need it. The platform can be fully customised to meet your specific needs. Use our telephone interpreting service to easily manage you and your team’s appointments and to establish your requirements early. Schedule meetings on-the-go using our app to cut out the lengthy planning stage. Wolfestone’s network of carefully vetted and experienced interpreters are available 24 hours a day, 7 days a week via mobile, tablet, computer or telephone. You can choose whether to communicate through video or telephone and 99% of calls are connected within one minute. Wolfestone’s telephone interpreting service is a quick and affordable way of meeting your immediate needs. Whether you want to set an appointment or need a quick exchange of information, our interpreting service is on-hand to help. Telephone interpreting has long been utilised by public services such as hospitals and the Police, but as our society becomes increasingly multicultural and multilingual, the benefits of telephone interpreting are being discovered by many different people. What are the Benefits of Interpreting with Wolfestone? Instant: Our new service is available on-demand, cutting down lengthy planning times and costs. 99% of calls are answered within a minute, so you’ll never be left waiting. 24/7: Our telephone interpreting service is available whenever and where you need. Download our app to set up meetings on the go. Extensive: With over 210 languages to choose from, you’ll have an interpreter ready for any situation. Quality: We only use native, experienced linguists. All our interpreters are fluent in their language combination. Customisable: Memorise your favourite providers so they get contacted first. If they’re not available, you’ll be instantly re-directed to the next available provide to reduce downtime. Affordable: We make savings thanks to our advanced technology, and we pass those savings on to you. We offer some of the most competitive rates in the industry. No Obligation: There are no set up fees and no contract necessary. 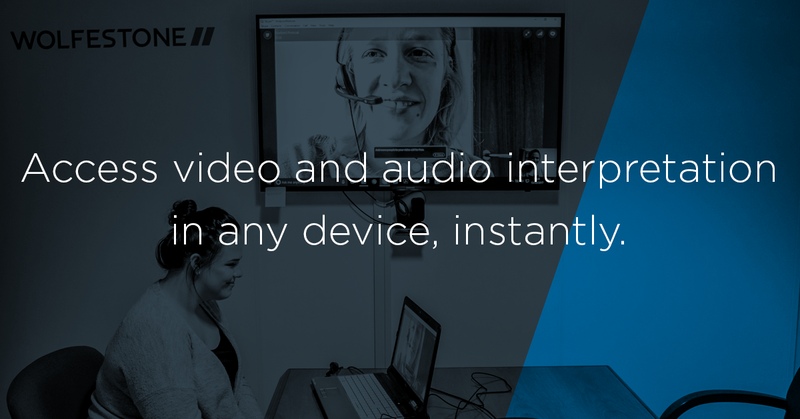 If instant, on-demand access to a language interpreter is something that will benefit you and your team, contact us now to see how we can help.